Abstract:The research wants to probe into the present condition of National Fitness Program for 26 communities in Guangzhou, by investigation, comparison and visition. The result shows that people in Guangzhou have relatively high consciousness for physical activities. 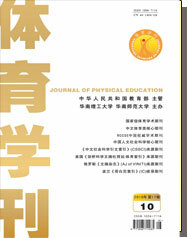 National Fitness Program that helped improve people's exercising conditions was popular in Guangzhou.Measures for providing equipment and putting investment were being gradually consummated.The authors point out the problem of National Fitness Program and put forward the future's developing countermeasures.